"Powerful and innovative web browser based on Chromium"
Google Chrome is one of the most stable and reliable web browsers in the market. It is based on an open source project named Chromium, as well as the following application. SRWare Iron is a powerful web browser based on the Chromium code and works similar to Google Chrome, but which gets rid of most of the security concerns raised by Chrome. With SRWare Iron you no longer have to worry about Google possible spying on your online activities. 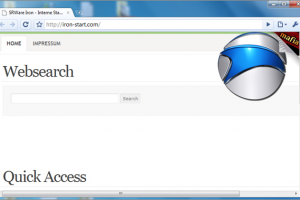 SRWare Iron features a simplistic and friendly interface to feel comfortable when surfing the internet. It offers extremely fast site rendering and a modern and innovative design, but it doesn’t store personal or send your browsing preferences. Now you can enjoy all the benefits of Chrome but in a browser that doesn’t share your configuration with any online server. SRWare Iron is a fast web browser optimized for privacy and security, the main concern nowadays.